Mangaluru, Nov 28 2017: City DCP (Crime and Traffic) Uma Prashanth said that the MCC authorities have been asked to setup barricades and sign codes while digging up the roads for development works and pipeline works, so as to prevent accidents. She was speaking during the SC/ST grievance redressal meet at the Police Commissioner’s office in Mangaluru. 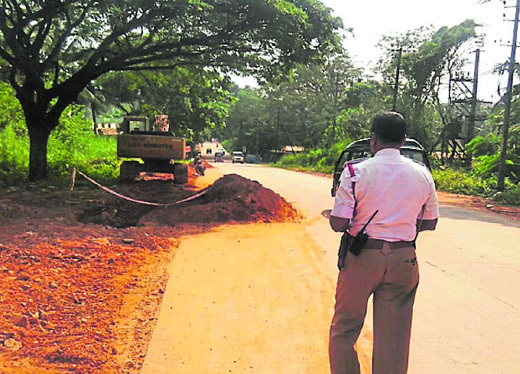 The DCP’s response came in the wake of a concern raised by a Dalit activist S P Anand, who pointed out that the MCC authorities had dug up the road for pipeline works in Kavoor, without erecting barricades on the site. Prakash, a final year undergraduate student and a dance instructor, was returning home in Kunjathbail on a motorbike on the night of October 19. Prakash could not see the mound of soil in the dark and his vehicle got trapped in it, throwing him on the road. He succumbed to severe head injuries in a hospital. A complaint was filed against the contractor of the work at Kavoor police station on October 19 itself. But, no charge-sheet has been filed, so far, while the heap of mud was cleared overnight. Raghuvaran, a friend of Prakash, said that the pipeline work was carried out in other localities of Kavoor too and no road safety indications were put up on the site. The work has been stopped now. Dalit rights activist S P Anand said that Prakash, Jyothi’s younger son, was supporting the family while another son Sathish is studying in Sullia. Jyothi’s husband is bedridden and could not go to work. Jyothi’s leg was seriously injured in a train accident many years ago. He also told the meeting that the school vehicles are not following the rules. The illegal massage centres are operating in the nooks and concerns of the city, the Dalit activist complained. Anand further said that leachate spilling on the road from lorries transporting fish, causing inconvenience to two-wheeler riders and urged the police department to initiate action on the same. Parvathi Chembugudde said that false cases were lodged against her intentionally to defame her in the community. She requested the concerned to initiate action. Dalit leader Mukhesh alleged that station level SC/ST grievance meet has not been conducted at Kankanady police station since the new police commissioner has taken over. The menace of skill games was raised on the occasion. Traffic ACP Manjunath Shetty, ACP Rajendra and ACP Uday Naik were present.